CINSO is excited to bring the international science festival Pint of Science to Indianapolis May 23-25th! Pint of Science is a global science festival taking place annually over three evenings in May. There are many amazing children’s events out there, but people’s curiosity doesn’t stop when they become adults. This event allows grown ups to learn about and enjoy the wonders of science in their playground, i.e. their local pub. Stay tuned for more details by following us on facebook,twitter, and signing up for our newsletter! Want to volunteer, help plan, or present? 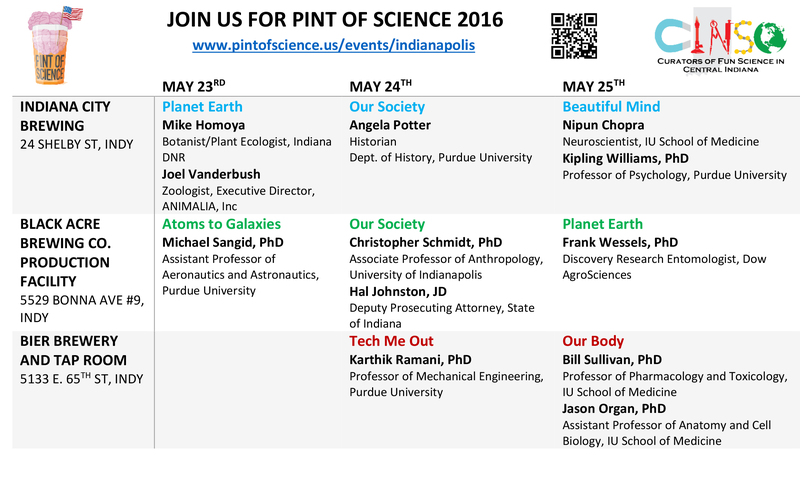 Email us atindianapolis@pintofscience.us! Check out what The Indy Star and Indiana on Tap have to say about #PintIndy.